This morning Bushiroad of Japan's weekly information bulletin guest starred seiyuu Morishima Shuuta (voice of Nitta Shin) and Yanagita Junichi (voice of Anjou Mamoru) in a featured fight between Shin's Yasuie and Mamoru's Dragonic Blademaster decks. 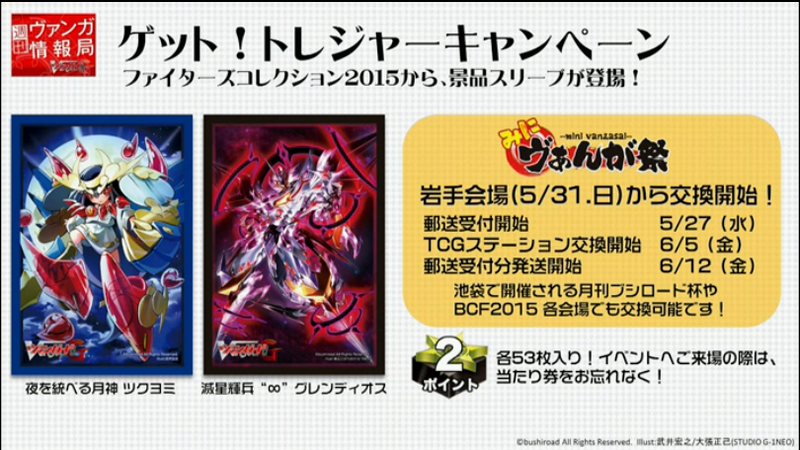 The broadcast also revealed two upcoming promotional sleeves from the Get! Treasure Campaign, featuring Deity of the Evening Moon Tsukuyomi and Death Star-vader “∞” Glendios from G-FC01: Fighter's Collection 2015. The sleeves will go out in early June. Doctor O also took the opportunity to introduce several cards for both Murakumo and Kagerou from Sovereign Star Dragon, but these announcements were preempted three hours earlier by Japanese fans leaking the remaining cards of the set, much to the company's chagrin. The full video of the broadcast, including the fight, is presented below. Yanagita retaliated with Blademaster's on-stride skill to retire the booster Ataka, comboing this to his rearguard Soheyl's autoskill to give him +5000 power. (As this only activates when a rearguard in the same column is put into the drop zone, later retires were not applicable to Soheyl.) Using the stride Divine Dragon Knight Mustafa, he then retired Tokubei and gave Mustafa an on-hit unflip. With Twilight Arrow's counterblast, Yanagita then retired the Onifundou that remained on the field, neutralizing the advantage Morishima had built up in the previous turn. Yanagita then forced him to five damage in that turn, and with only one unit in play, to meet the conditions for Homura Raider during the stride step Morishima was forced to clone his draw trigger Cat Rouge. And when Morishima attempted to go on the offensive, Yanagita guarded with the promo card Lizard Soldier Belogue--Belogue's skill allows it to retire an opponent's rested rearguard during the guard step if the guard is successful, meaning that Yanagita could completely nullify Homura Raider's skill by retiring one of the rested Cat Rogues, preventing Homura Raider from returning three units with the same name to the deck and restanding. Since Homura Raider had already received drive check -1 from its own skill, it wouldn't even get a single triple drive, let alone four drive checks; retiring Cat Rogue would incur a net -4 for the entire turn against Morishima. Morishima-as-Shin had to beg Yanagita-as-Mamoru not to do it in order for them to show Homura Raider's skill on camera, illustrating the vast disparity in support between Kagerou and Murakumo. Yanagita obliged, retiring Fujino and using a Protect Orb Dragon to achieve perfect defense against Homura Raider. Although Morishima enjoyed a brief window with which to win the game on his second twin drive, failing to check a critical trigger prevented him from sealing it, causing Yanagita to win on his following turn. Morishima's game was incredibly skillful overall. By standing his boosters and giving them power with his stand triggers, he was better able to take advantage of Ushimitsu Train's double superior call to clone Tokubei twice. His main misplay was fielding and then targeting units which only had one or less copies remaining in deck, in this case Nyudo Cloud. Doing otherwise would have given him two attacks, one for 12000 power and another 34000 power. His second was in using Fujino to attack the vanguard instead of the rearguard, exposing him to Belogue's skill, which otherwise can't be used while protecting rearguards. However, in general there was little else that could be done on his end of the game to fight back once Yanagita swung the game in his favor with Mustafa, Twilight Arrow and Soheyl. Making his one opening in the opponent's defenses with Homura Raider's second attack was his one chance to end the game. Doctor O proceeded with an overview of several cards from Sovereign Star Dragon, including Dragon Knight Emad, Mustafa, Homura Raider and Hidden Scroll. However, all of these units were already spoiled by this time thanks to fan efforts. After a brief overview of the currently ongoing Cardfight!! Vanguard G the above sleeves were unveiled, and Doctor O closed out the broadcast alongside his guests imploring viewers to "Ride KYUN Vanguard!" Almost seventeen thousand people tuned in to view the live broadcast during its run. Bushiroad's weekly information bulletins air every Tuesday evening at 8:00 PM Japanese Standard Time. 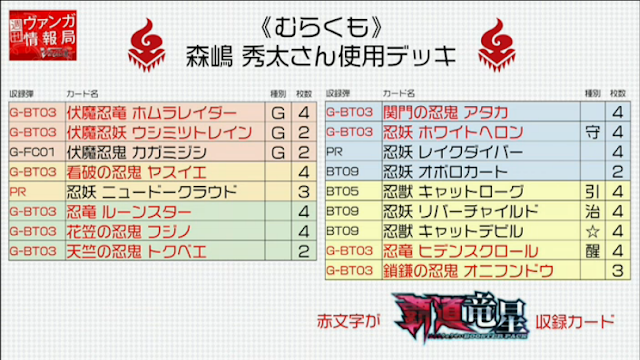 They first began in late January to accommodate a new information distribution model for Cardfight!! Vanguard G, as the amount of card information covered in Monthly Bushiroad magazine decreased and was redirected to other routes of distribution. The previous week's broadcast introduced Spear Cross Dragon and several other units from Sovereign Star Dragon, and the week before covered Deletor cards from the same set. Next week's episode will be a special G-BT03 release party guest starring Ishii Mark, seiyuu for Shindou Chrono.